The opening day of London Fashion Week may have been all about the new collections but there was a patriotic surprise in store for the attendees of Corrie Nielsen’s morning show. 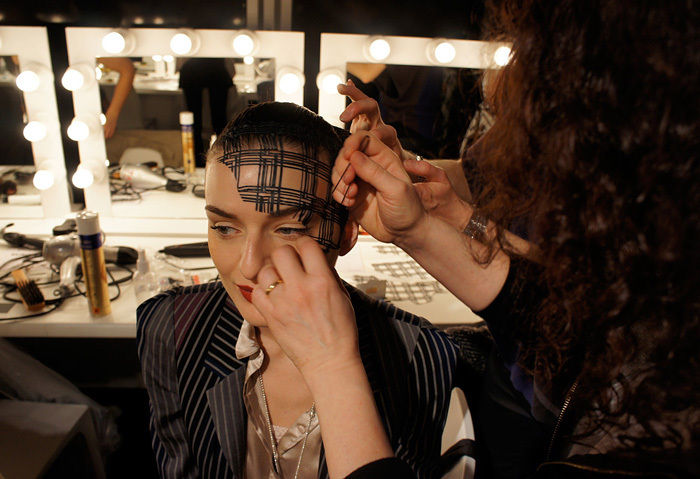 As the music began and the first models hit the runway, my twitter stream turned tartan-crazy. And it wasn’t just for the clothes. 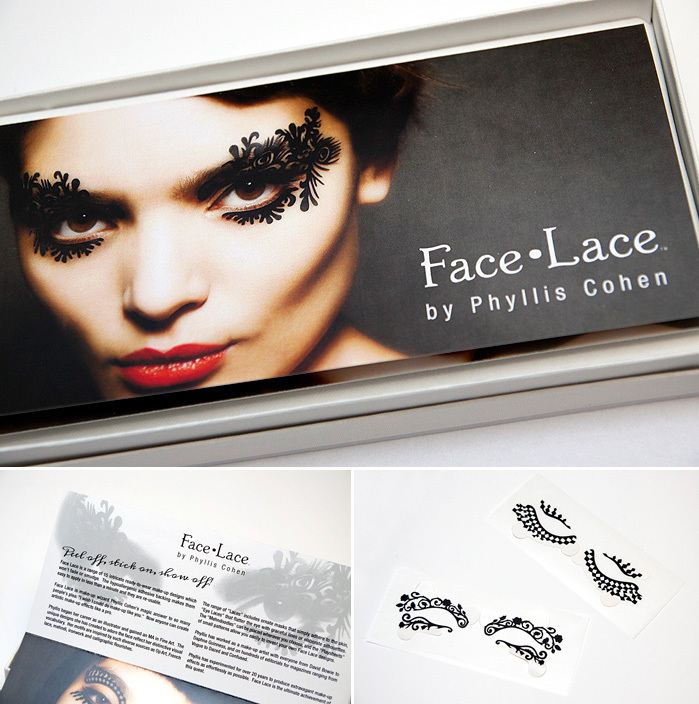 Makeup artist Phyllis Cohen used today’s show to unveil her new venture, Face Lace. A collection of 15 ready-to-wear makeup designs that adhere to the skin with no mess, no fuss and no artistic skills required. Known for her intricate designs and bold style, Phyllis began her career as an illustrator, which when combined with her MA in Fine Art, goes a long way to explaining the quality and intricacy of the designs. The Face Lace range includes full ornate masks , smaller eye laces which embellish the eye with whimsical patterns, mehndoodles which can be placed wherever you choose, and playsheets of small patterns which allow you to invent your own designs. A sample of the Eye Laces arrived yesterday morning and my first thought was that I would struggle with application. The intricate designs are delicate and need to be handled with a certain amount of care – crucially though, they’re far easier to apply than I ever would have imagined. Once you’ve peeled off the backing, you simply align the inner corner wherever you’d like it placed before pressing down. The adhesion is immediate with no rippling, bubbling or any of that nonsense. I smoothed along the path of the pattern until I reached the other end of the lace and it applied perfectly! Fluke perhaps? I thought so too, until I applied a further three laces with the same ease. The adhere without any issues over a full face of makeup (and my eyebrows!) and I wore them for a full five hours without any lifting or other indications that they wouldn’t last the course of an evening out. Removal was a tinier bit trickier because you have to take care that the lace doesn’t a). stick to itself as you peel it away and b). tear under too much pressure. All in all, it took me less than three minutes to both apply and remove. False eyelashes can take me three times as long. So, it’s all really positive. My only concern is when I’d ever have the opportunity to wear something so edgy in my day-to-day life! Wanna see how they look? Please bear in mind that the photos below have clearly been photoshopped to hell in the name of ‘art’. Not something I usually do, but – well, I don’t usually wear Face Laces either. The Face Lace website went live yesterday, though they’re not shipping out the laces until the end of March. 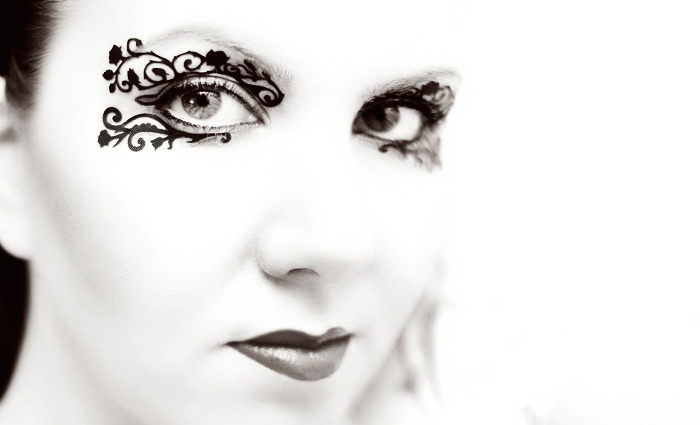 To stay informed of any changes – follow them on Twitter @face_lace or via Facebook here. Would you wear a Face Lace? O.o CHARLOTTE I HAS SO MANY FEELS ABOUT THIS POST. 1. I want Face Lace!!! 2. Your pictures are fab. 3. I want Face Lace!!! They look amazing, as do you :D. I love the photographs. These are so gorgeous and intricate, but like you not sure when I’d wear them! Love these! You and your pics totally do them justice. I can’t think of a time when I’d feel I could bust these out, but you look amazing! Stunning, you looks incredible in them and frankly I think you should wear them when you do your next Asda shop. Your photos are, of course, fabulous. And hell yes, I want and would wear face lace, even though at my great age I would look utterly deranged – I love how they look on. Although have just realised I wear glasses so would look a complete idiot with face lace and specs, bugger! 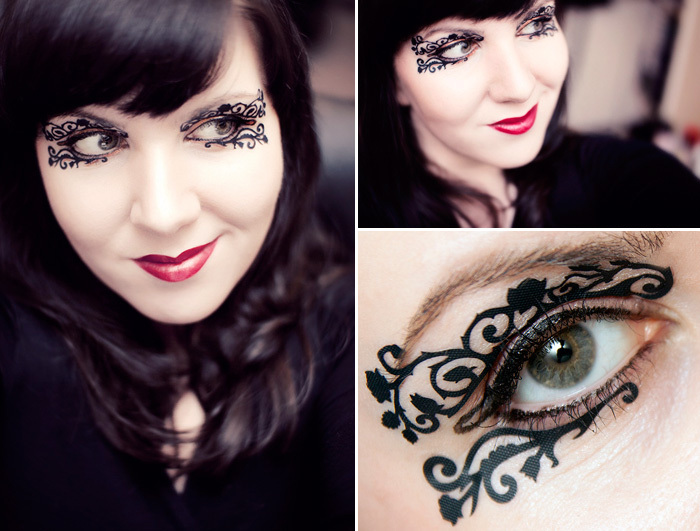 Wow, these Face Lace decals are fantastic. I really can’t imagine having anywhere to wear them. argh!!!!! I want them so bad!! I hope they ship to the US. Ooohhh these are so neat! I wouldn’t wear them every day, of course, but I’m sure I could figure out a special occasion for them! I might get some to wear next time I go to a gig! I think I am in love! Have you tried them over any shadows or primers yet? Curious about the adherence and longevity in that regard. Wow, are those ever gorgeous! I really wish I had a reason to wear these.